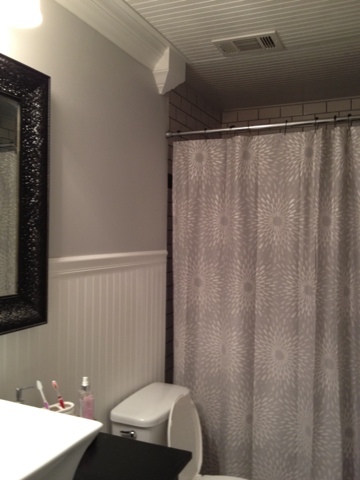 Slowly but surely, our Master Bathroom is coming together. Today, I don't have a HUGE update, but rather a small one. But, It's amazing how the small things seem to make such a big difference. 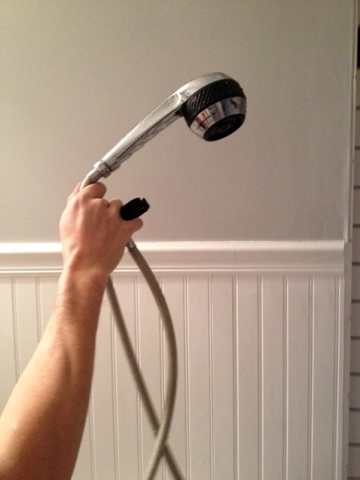 This week we changed out our 1980's massage shower head to a much more updated one. I am so super proud of it and am finding it even harder to get out of the shower in the mornings. I hate that we forgot to take a "before shot," so Hubs decided to just hold it up for dramatic purposes. Ha... love that he humors me. I almost ashamed to admit that I have been showering with this thing for over three years. 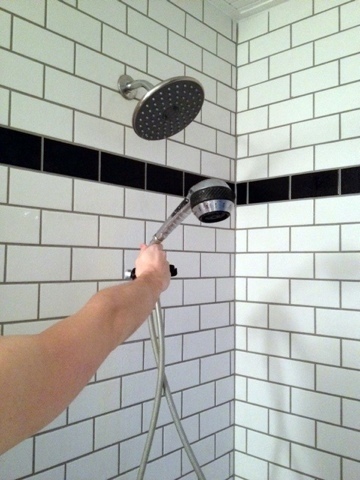 YAY for a new, modern shower head! OMG, such a difference - at least it is to us! same color as the paint on the walls, and I am always a sucker for anything star burst related. 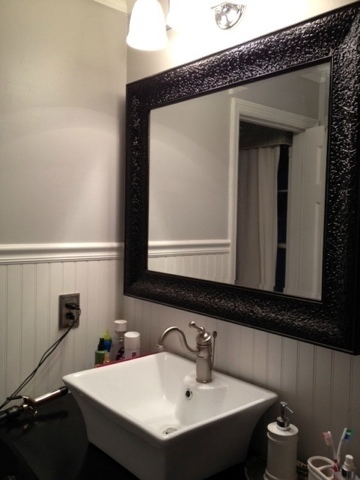 I am so thankful to have a functioning bathroom again. Woo hoo! Thank goodness it no longer looks like that! We still have to get the tub glazed, find new rugs, add a towel rack, and find some art... but we are so close to calling this room complete. I can't wait to be totally done. I am so thankful that tomorrow is Friday. This has been the longest week ever! Hope you all have a great weekend! Wow I LOVE your bathroom! 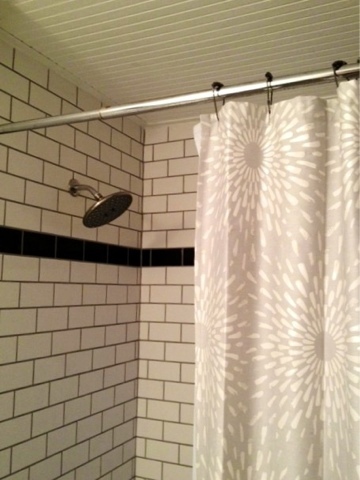 That is the showerhead of my dreams, haha! I just found your sweet blog, and I am so looking forward to being your newest follower! Visit me over at Cupcakes and Candy Canes sometime! 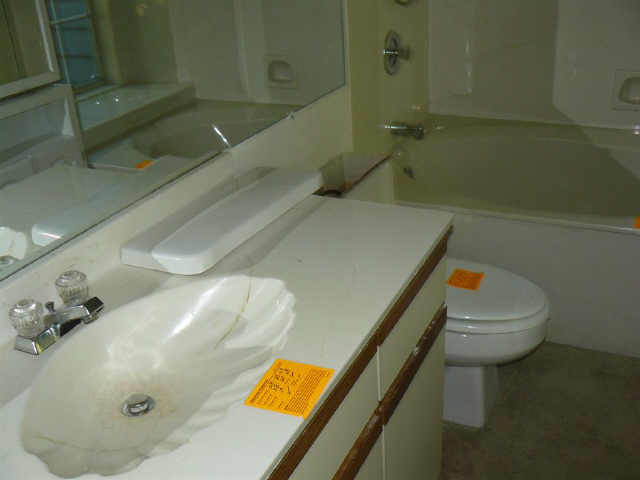 Even without one of those whirlpool bathtubs, your bathroom still looks great! Love it!